RUGBY LEAGUE: When the Grafton Ghosts needed a lift in the Group 2 major semi-final last week they turned to the loudest bloke on the field. Now, staring down the barrel of a do-or-die preliminary final, Grafton will again turn to their man, Joel Moss. 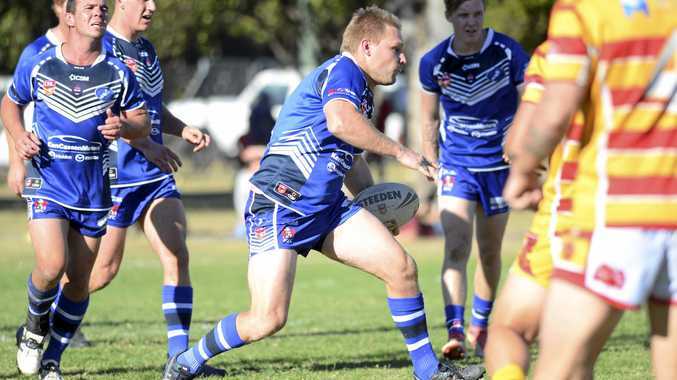 The hard-running winger has plenty of experience at the pointy end of the season, and it is big games - like tomorrow's final against Macksville - that he lives for. "This is a massive game for us, we want to make the grand final again,” Moss said. Moss has taken a role in recent seasons as the Ghosts megaphone. From his right wing over to the left, everyone listens when Moss speaks. The Ghosts have made several changes to their line-up with Matt Muller cleared to return from injury and Ben Liyou called up to the squad. Liyou will go into right centre, inside Moss, with Ghosts secret weapon Mike Curnow shifted to the bench to give the side impact off the pine. It's a change that Moss is backing all the way, with the experienced winger excited to play outside the young buck. "I trust him 100 per cent, he is the best young footballer in the Valley,” Moss said. But it is the return of Muller that Moss feels will make the biggest difference for the home side, with the second rower sealing up the right edge. Riley Law has also dropped back to an explosive bench with Ben McLennan ready to take a spot in the second row, despite being taken from the field in an ambulance last weekend. Wicks has named an extended eight-man bench with four players to be ommitted from the come game day. Rising junior and NSW Country representative rugby player Caleb Barker was named on the bench. PRELIMINARY FINAL: Grafton Ghosts v Macksville Sea Eagles at Frank McGuren Field. League tag kicks off an action-packed day from 10.30am.